The current version of Visual Studio (2013) came with a minor framework update in form of the .NET-Framework 4.5.1. What was missing? An update of the C# language! Not even Roslyn was included, but I think that this is no problem at the moment, since it is quite likely to be included in the next version. Aren't we happy with the range of possibilities that are delived by C#? I think that has nothing to do with the fact that software is never finished and that one can always improve something. So what will be in the next version of C#? First of all, we will not see such a game changing feature as with the async / await keywords. Nevertheless it seems like there will be some quite useful new constructs available. Additionally the compiler will be even better in doing his job and help us where possible. Together with some other upcoming features, like RyuJIT, we will not only be more productive, but also get more performance for free. There is still some work in progress and some of those features might not make it to the next version, if ever. Also this article is very speculative about how these features work. So everything in this article has a certain possibility for failing. I'll try to update the article once the next version shipped, such that future visitors of this article will not be confused by some bogus information. C# has evolved from a clone of Java that is worse than the original to an elegant language with a ton of useful features. All in all C# should be the language of choice if the target platform is Windows or if one wishes to program efficiently cross-platform by using Xamarin's Mono. With that information back in our mind, let's have a look on what features are likely to be included in the next version of the C# programming language. In the following a list of possible features included in the upcoming version of C# is presented. The list of features is still not cut in stone, which is why I placed a probability qualifier in the end. A high probability means that I personally would say it is very likely to be included, wheras a low probability means that I personally have my doubts about this feature. It should also be noted that the presented example code will not compile on current C# compilers (December 2013). Also even if the discussed feature is included in the next version, there is some probability that the syntax has been changed or that I made a mistake or typo. In any case just view the examples as a guideline about how code might look in the real-world. It is also possible that the variables, x and y in this case, are auto-generated by the compiler. This would make the primary constructor even more useful. The constructor represents some redundant code, since we are only creating it for picking the right base constructor. This is not very efficient, so a better syntax for such scenarios would be much appreciated. Let's rewrite it with a possible C# vNext style! The problem would be solved quite elegantly with this syntax! Therefore primary constructor could be used for simplifying our classes and for simplifying base constructor calls. We can define primary constructors or call them. On the other side: What about partial classes? Obviously only one part is allowed to define a primary constructor and therefore to call a base constructor with arguments. All other partial definitions would not be allowed to do that. All this should also be valid for a struct type, however, there may be some subtle differences that come along with the unique properties of a structure in C#. This does not change the general thinking behind primary constructors. This feature seems to be very likely to be included as it would reduce some redundant code. Auto-properties are really useful. We can use them at several occassions and we should actually prefer them to fields in the first place. There are reasons for this, but we will not discuss them in this context. However, now we are back at a pretty ridicolous property from the class's perspective. Why wrapping such a setter in a method, if one does not need the method character? Of course there are good reasons for this. We could easily extend the method body while not having to alter any other code. We could also change the setter to public again or create a protected setter. All this is easily possible with the current construct. Nevertheless for the purpose that is covered by the expression above, the expression itself seems to add too much overhead. This syntax seems to be great if we want to ensure that properties only get initialized once, and will never change their value later on. Therefore this is like applying the readonly keyword to a field. The Java programming language is able to do a static type inclusion. Additionally some people familiar with .NET already know that VB is also capable of doing this. Static type inclusion means that the methods defined in a static class (also called procedures and functions) can be invoked, without specifying the name of the static class for each call. So this is like seeing the static class as a namespace. In this sense the static type inclusion is a possibility of using this "namespace". Static type inclusions lets us now tell the compiler that we want to act as if the functions (in this case Exp, Cos, ...) would have been defined in this class, MyClass. How does this look? This feature is highly controversial and might lead to strange code and ambiguities. However, in the end one should decide if it is really worth using this feature from case to case. If the inclusion imports functions with names like Do, Create, Perform or Install then confusion is probably part of the game. If math functions are imported the decision is quite obvious. Earlier we've seen that the properties are being extended with C# vNext. This is great, since properties make C# a very powerful language, that is also fun to write. Properties have been very useful from the start, however, with the integration of automatic properties we got rid of any excuse not to use them. They are just everywhere and this is definitely a good thing. Nevertheless, people wished to have properties that do not reflect the value of a field, but a computation of other fields. In UML such a property is called a derived property (usually marked with a slash). Now, there is no excuse in not using those. Such properties are very useful, since they are very crucial for the information hiding principle. After all, even a simple property like Count might be a derived property in most scenarios. This means that the actual value is computed when the property is accessed. In fact the resulting syntax is quite close to the one from lambda expressions. Finally we just need to assign an expression to the property. Let's rewrite the previous example with the new syntax from C# vNext. This syntax is using the fat arrow operator to assign an expression to the public member Dist. This is what we call a property. All in all I personally feel the tendency to use lambda expressions / the fat arrow operator a lot more often. This trend is a good one, given that many people actually like this kind of syntax. The property expression is quite nice, but what is the lesson from this language refactoring process? If we can do it with properties, is there another part of the language where this feature might be useful? In fact there is one: Since properties are just methods, why shouldn't we able to decorate methods the same way? It is no coincidence that the chosen example for this feature is very close to the one given in the property expression section. In fact this is just a simple transformation to illustrate the point being made here. Now let's use the same syntax as before by applying it to the given method. As before, this might be handy, but it is not that much shorter. Of course this feature is coupled to the general idea of allowing those expressions. If properties won't have them, they will also not be available for methods. On the other side, even if properties allow such expressions, we cannot be sure that they will be allowed for methods. There are actually reasons against this. Personally, I like this feature and even though the benefit is minimal, it adds a fresh touch to the language. But every feature that makes C# somewhat more complex and productive, will also result in a possible barrier for newcomers. Parameters are kind of fixed in C#. If we have a method that accepts three parameters, we need to insert three. Of course we could work with default values, however, we will have to specify a name for each parameter. A variadic parameter as in C/C++ is missing. "Missing?!" you say... Yes, of course there are two exceptions. One is the undocumented feature called __arglist. But this is a mess to work with. Additionally this feature would not be undocumented and anyone should use it! So what is the other exception? It is of course the params keyword. How does this work? The compiler will identify the specified method with a method, that has a params argument. This argument has to be the last argument. Now the compiler will identify all parameters that would belong to the params argument, create an array and pass this array. Within the method the params argument behaves like a normal array (as it is a normal array). The compiler might also do some implicit casting for creating this array. Additionally we can have overloads that are more specialized, e.g. for 3 arguments or 1 argument. The method specification with the params argument is only used if no other overload matches the signature demanded by the caller. The last method call illustrates the problem. Why can't we hand in an enumerator as a variadic parameter? C# vNext now tries to allow this. The feature is based on the exact same syntax as before, however, we need to change the expected object from an array, to an enumerable. Of course this is much more flexible and works great together with LINQ. The transition is then actually from a T array to a IEnumerable<T> enumerable. This now is "backwards" compatible, since every array implements an enumerator. Obviously this feature is also great since it will allow basically every enumerable to be passed as parameters, e.g. List<T> instances. In what scenarios shouldn't we use this feature if its available? Well, sometimes we are actually interested in the parameter count. In this case one would be forced to iterate over all the elements. Of course, there is a shortcut by calling the Count() extension method, however, the required instructions for the iterations still need to be executed. Hence we could say that if we need a fixed set of elements, then the currently existing method is the way to go, otherwise we should definitely prefer to use the enumerable params. I personally would love to see this feature, since it makes working with a variable amount of parameters more flexible. What the heck is this? Actually I know too many C# developers who are not aware of the coalescing null operator, or ?? in code. And now this! Another operator that does something with null referenecs. null is a great way of introducing bugs, having more if statements than needed and bringing in complexity in trivial programs. Nevertheless, we require the notation of an unset reference, otherwise everything would be required to fall back to some default value, which would be required to be defined. Great! This is much shorter to write, but more expensive and really stupid code, since it will not only catch null references on a, b, c, but also within the property calls. Therefore any "real" null exception will also be caught, without us noticing that this is a real bug happening. This works, but it is not very efficient. The main problem here is that we are allocating a new object for every reference that is missing. This object is only required for a very short time. If we now call the SomeMethodCallWithDefaultValue method very often, we might become a performance problem with the GC being required to run to often. Now the question is: Why do we have to do this, when these classes could automatically return the default instance instead of a null reference? We'll probably never know... Back to the original question: How can we achieve the same as in the previous code, but without creating new instances or using sample instances? The answer is of course given by the title of this section: monadic null checking! 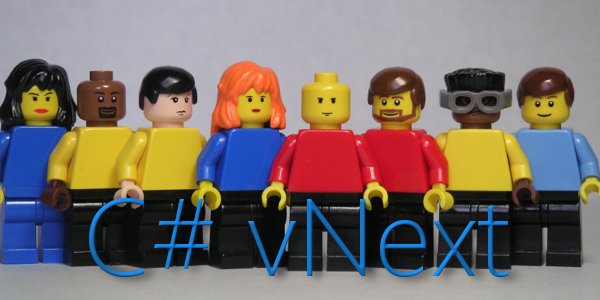 C# vNext could introduce a new dot-operator: ?.. Obviously this could create a chain, which would be broken once a null reference is detected. In such a case we obviously require a default value. Otherwise we will return the result of the chain. Looks a little bit like the ternary conditional operator. This does not appear to be very complicated, but does a nice job in hiding the complexity from us. Obviously null values are required (i.e. nullable<T> structs or classes in general) for this to work. Otherwise the usage of the null coalescing operator would not make much sense. Else what's the outcome if we break the chain, but do not supply the null coalescing operator, i.e. a default value? Even though this feature seems again very useful there are some very important questions that need to be discussed. Why shouldn't value types be included? If value types are included, should those be casted to nullable? Of course the chain cannot break on value types, since they will never be null, however, if the last (i.e. returned) value is a value type, then we cannot use the null coalescing operator, as mentioned earlier. This solution avoids value types in general. Therefore we cannot use it as previously shown. Nevertheless by using the monadic null checking, we could reduce the complexity of the method. Additionally the whole thing looks a lot more reader-friendly. Obviously this introduces an implicit cast. So what kind of solution is better? Both have their flaws, but also their positive sides. Since a decision is required, all options have to be thoroughly considered. I think such a feature would be really nice to have, but the questions that I can think of have to be answered. Let's see if such a feature makes it into the next version, and if so, how the C# team solved it. There is no way for the compiler to resolve T, just by looking at the method call (which will in this case always look like Write()). Of course one could argue, that inferring this type is possible in theory, if one consideres expressions like int a = Write(). However, this is currently not supported by the C# compiler. Obviously we can have overloads of a generic method. If we do not specify a parameter, then the first method is taken. In case of a single parameter, the choice depends on the type of the parameter. In case of an integer, the last method will be taken. In any other case we'll end up with the generic method. This is quite similar to the case with methods. It even get's more similar if we think in terms of constructors. A constructor is a method that we get for free. It is automatically invoked once a new object has been allocated. Additionally constructors control if it is possible to construct an object, and what parameters are required to instantiate the object. To trigger the invocation of a constructor we need to instantiate the object with the new keyword. Here we replaced the implicitely given standard constructor of the generic version with a constructor, that takes one argument. The argument has the same type as the generic type parameter of the class. The question that we could ask now: Is the following call possible? In case of passing an integer parameter, we cannot take the generic one for sure. Explicit methods had a higher priority before, and in order to stay consistent with that we also need to prefer explicit constructors in this case. In other cases we do not know if the parameter is actually being passed in by mistake or if the generic version should really be able to handle this. As already mentioned older C# versions had a very elegant solution to this problem: Avoid the problem by not allowing constructor type inference. C# vNext finally wants to include constructor type inference. What about our two problem? As with methods, explicit constructors will be preferred. This means non-generic beats generic. In such cases we still need to express the type arguments. If a generic constructor matches the signature then a generic constructor will be taken. We are responsible for avoiding mistakes by not using var, or having a look at the type beind inferred by the compiler. All in all I think that this feature is really useful. This means that instead of writing, e.g. we can write the same statement as follows. This feature is very likely to be introduced, since it has been missing for a while. On the other side one should not forget why it has been missing. Being careful with constructor type inference is therefore an obligation. C# introduces two possibilities of passing in values by reference. One is by using ref parameters, the other is by using the out keyword. I personally like having two keywords for practically the same thing (even though the compiler imposes some constraints on out parameters, which really make sense). After all in C one was required to introduce some kind of convention on reference / return parameter names. Otherwise other programmers couldn't know how the parameter was being used by the routine. How is this then used? Well, there a some open questions. One certainly is, if this is just a temporary container, that cannot be accessed after the initialization. The other one is, in which scope does the variable live? Obviously the scope that is used by the body of the if-statement is not the parent, since the method invocation is required for going into the scope. On the other side the parent scope does also not seem right, after all we might have a scenario where this method is never called. In this case the method is called if the condition is not fulfilled. The question now is: Is the variable a available after the whole conditional block? Those questions seem to be far away from real-world applications, but in fact they are not. There are really some open, unanswered questions with this syntax, which is why I doubt we will see it coming in the next version, unless all these questions can be answered without leaving ambiguities. As with all language features people will discuss some of them more than others. Also along with the contraversal factor some people will like or dislike one or the other feature more than others. However, it should be noted that every language feature is just another syntactic sugar. The next version is fully backwards-compatible and therefore let's us only be more productive. Personally I look most forward to primary constructors and monadic null checking. The additional generic type inference is quite nice as well. Enumerable params are long overdue and give us more flexibility. I also really like binary literals, since this is something that is somewhat easy to implement, but not available in most other languages. The increased possibilities with properties are nice, but nothing that I would consider absolutely required. Created 1/6/2014 9:10:42 PM .